In 1982, when Sunday in the Park With George debuted on Broadway, it was a smash hit. Fast forward to revivals and now, a tenure of it playing at ZACH Theatre in Austin this month. It’s a must-see. We all know Stephen Sondheim’s Pulitzer Prize-winning musical masterpiece is a living painting by artist Georges Seurat, and centers on the artist as he discovers unimaginable possibilities while creating an enduring work of art. 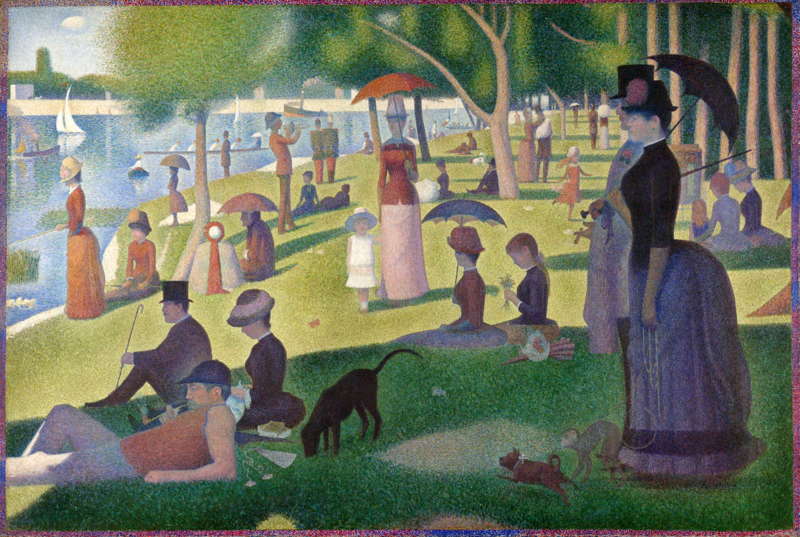 Seurat, known for juxtaposing points of multi-colored paint to allow the viewer’s eye to blend the colors, connects the dots that make life so passionate, unexpected, heartbreaking, and ultimately rapturous. In fact, all the characters in the painting, in the play, come to life with fascinating and interwoven back stories. The original music and lyrics are by Stephen Sondheim with the book by James Lapine. At ZACH, it’s directed by Dave Steakley with musical direction by Allen Robertson making every moment of the two hour and forty minutes (with an intermission) a super way to spend a summer evening. The wildly talented cast is led by Cecil Washington, Jr. as George/Georges and Jill Blackwood as Dot/Marie. In fact, the live, onstage orchestra brings the radiant score about the art of making art – and love – soaring to brilliant life with “tension, composition, balance, light, and harmony.” The gift of this musical is that the people who are the most different from us, may be the persons who illuminate ourselves to ourselves. Where: The Topfer Stage at ZACH Theatre | 202 South Lamar | Austin, TX 78704.